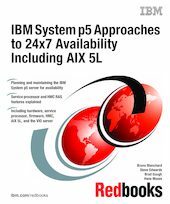 This IBM Redbooks publication focuses on the technology, serviceability, and features that are used by the IBM eServer p5 and IBM System p5 servers, which allow you to make your server one of the most reliable and available parts of your IT infrastructure. This book contains many detailed examples and step-by-step scenarios of usual server operation and maintenance tasks, such as the setup of redundant HMC and service processors, firmware upgrades, hot-addition of RIO drawers, or configuration of redundant Virtual IO servers. This book is intended for architects, specialists, and system administrators who are responsible for planning or developing an availability strategy for IBM System p servers.